The online National Planning Practice Guidance refers to health impact assessment (HIA) as a useful tool to assess and address the impacts of development proposals. The London Plan and many borough Local Plans also refer to the use of HIA. A health impact assessment (HIA) helps ensure that health and wellbeing are being properly considered in planning policies and proposals. HIAs can be done at any stage in the development process, but are best done at the earliest stage possible. HIAs can be done as stand-alone assessments or as part of a wider Sustainability Appraisal, Environmental Impact Assessment, or Integrated Impact Assessment. HUDU is able to provide bespoke advice and support on assessing the health and wellbeing impacts of development, and has undertaken a number of HIAs on behalf of primary care organisations. The process looks at the positive and negative impacts of a development as well as assessing the indirect implications for the wider community. The aim is to identify the main impacts and prompt discussion about the best ways of dealing with them to maximise the benefits and avoid any potential adverse impacts. HIAs are commonly categorised as ‘full’, ‘rapid’ or ‘desktop’. A full HIA involves in depth evidence-based analysis of all potential health and wellbeing impacts on different population groups, using research and community engagement. HUDU has developed a rapid HIA tool which is less resource intensive using existing evidence to quickly assess the impacts of a development plan or proposal and recommend measures to address negative impacts and maximise benefits. The tool does not identify all issues related to health and wellbeing, but focuses on the built environment and issues directly or indirectly influenced by planning decisions. Health impacts may be short-term or temporary, related to construction or longer-term, related to the operation and maintenance of a development. The tool has been used on strategic planning applications in London’s ‘Opportunity Areas’ and on infrastructure projects, such as the Northern Line Extension in Nine Elms Vauxhall. The rapid HIA tool can be downloaded here and a fillable form version can be downloaded here. 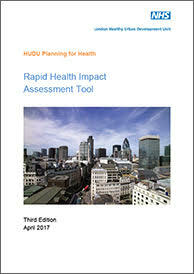 HUDU also publishes a healthy urban planning checklist which is a desktop assessment aiming to ‘mainstream’ health into the planning process. The checklist poses a series of questions based on London Plan policy requirements and standards which if met can positively influence health and wellbeing. It is intended that the checklist should be applied to larger (but not strategic scale)development proposals. It can also be used to help with preparing a local or neighbourhood plan, or to screen possible health impacts for a rapid or full HIA. Local planning authorities in London are encouraged to use the checklist and customise it for local use. 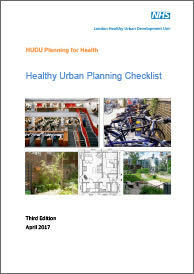 The Healthy Urban Planning Checklist can be downloaded here.